Both sleeves are finished, washed, and blocked, the back is very nearly done, and I have started on the ribbing for the left front. The front pieces, which include the collar, are both large and fiddly, however, so there is still much to be done. Dayana commented in her post that “nothing is quite so pleasing (and yet so alarming) as piling them all on top of each other!” Dayana’s alarm was no doubt due to the fact that she had quite a few projects on the go (I counted; it was 7). I, too, was alarmed but for a far different reason. I cast on for the Soumak Wrap on September 13, 2013! That was (just) over a year ago! And, I cast on my lovely Exeter on February 17, 2013! Clearly, this is a case of the never-ending knit! So I ask you, Dear Reader, what do you think was my immediate thought upon reading Dayana’s post? Was it to devote my efforts to finishing off these long-lingering projects? I fear not. My very first thought was: I have too few WIPs! Yes, I am the very same knit blogger who once wrote a post about the utter insanity of having too many WIPs. However, as I am sure we can all agree, when it comes to WIPs, two is not too many. I am knitting it with Madelinetosh Tosh Merino Light in Tart. Perhaps next September, it will show up in a post about long-lingering WIPs! All those ends to sew in, that’s enough to have about a million items in WIP, so you have have to sew them in! 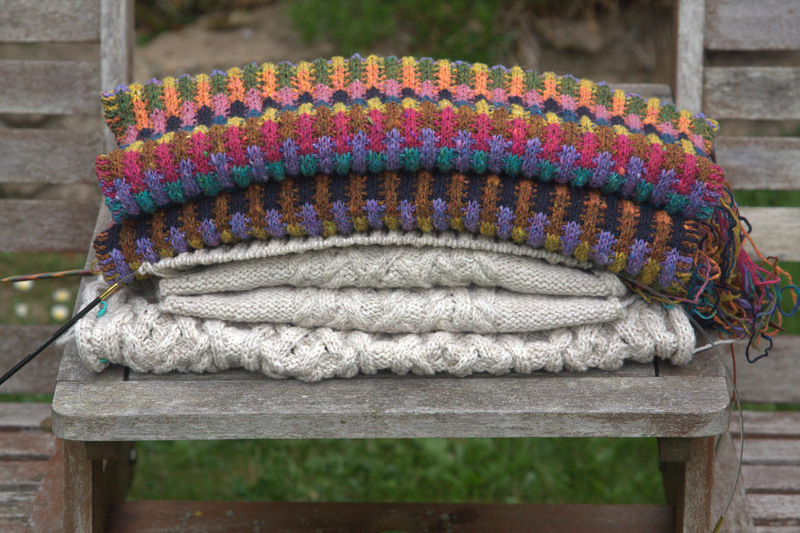 I try to think of weaving in ends as a Zen thing; that way, instead of being frustrating, it is sort of like meditation. Two was definitely not too many as they both look pretty complicated. The lightweight turtleneck may well take a while to knit but the colour’s gorgeous and it will surely be some relaxing mindless knitting! 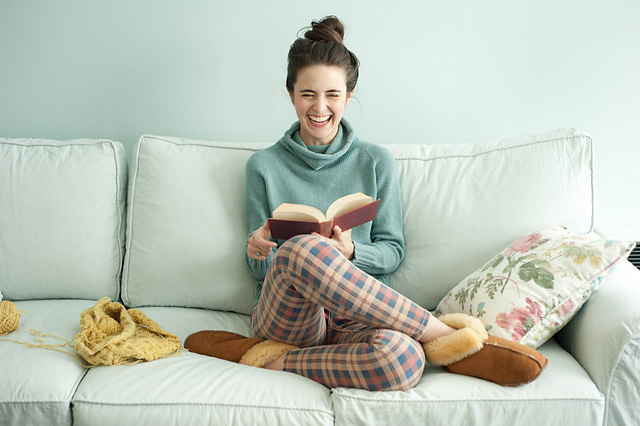 It seems as if relaxing mindless knitting was just what the doctor ordered. I can’t seem to put it down. Two is hardly enough! But, speaking as someone who usually has about 15, I probably shouldn’t be encouraging you. Can’t wait to see the finished wrap, tho. Looks gorgeous already! The weather is just starting to turn now, and its the perfect time to wear that wrap. Hopefully, I will get myself in gear! oooooh, I love the way you added a luscious third project. 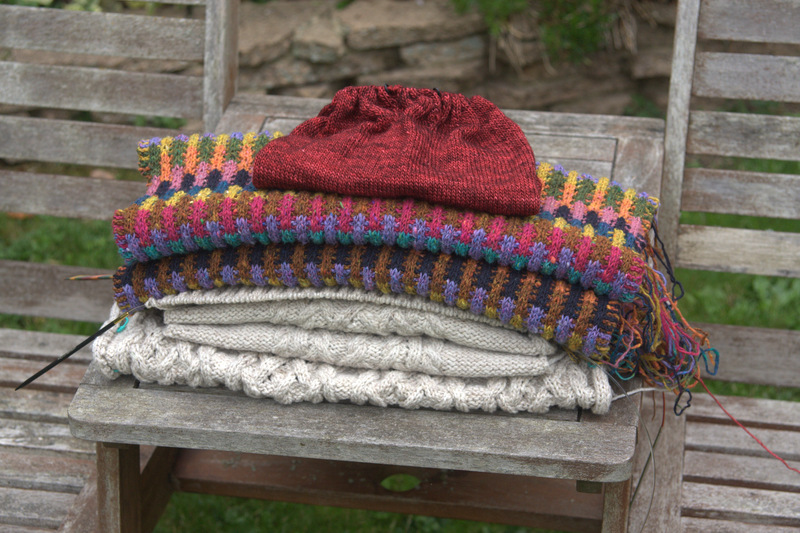 🙂 I dont; have any big, long term knits going right now – some socks, hat and a scarf is it. You make me want to cast on a sweater…. I find sweaters so intrinsically pleasing, especially in the fall. But I could also do with a short project or two, for morale’s sake. I did a nice big bulky sweater last winter, that knit up fast. I have a slower project in mind for this winter, and I keep putting it off in favor of shorter, faster projects. I should stop that. 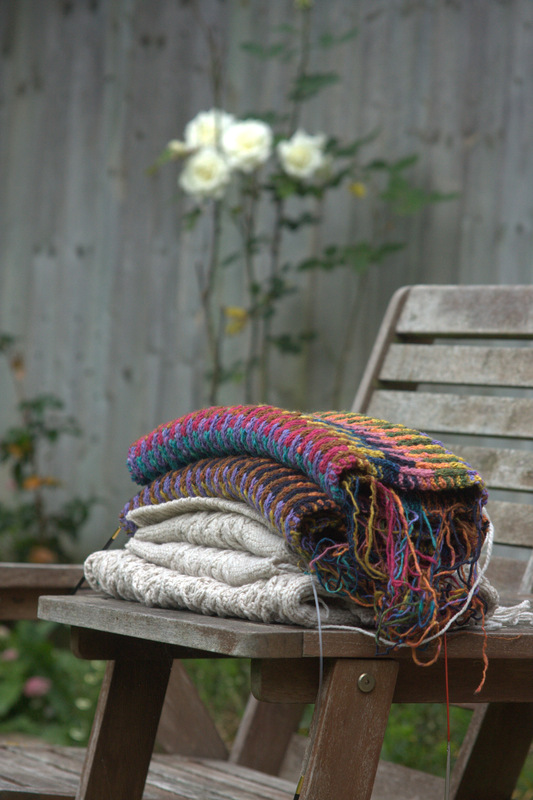 I have 4 shawls in my knittingbag, socks, one long-term project (a big blanket out of squares in 62 different colours) and a million plans what I would like to knit or crochet. If I would dive in the depht of my knitting boxes I surely would find a few more projects waiting to be finished …. 62 colours? Wow, that’s impressive. I am trying to be less disciplined and to work on the knit-what-makes-me-happy-in-the-moment plan. Oh, Jen, that is much too organized for me! I don’t do structure very well. But I am impressed with both your fortitude and your output. TWO IS DEFINITELY NOT ENOUGH!!!!!! Do you know how relieved I was to see that 3rd one appear? Oh, man, do I feel better. I did cheat on my pile, I had 2 finished ones in there. BUT to my credit, I neglected to add 2 from LAST YEAR (same start as your Soumak wrap!) which were not included due to shame. So damn. The count is still 7. Or possibly 9, shhh, don’t tell. Final thought: my pile is not nearly so cool as the one with the waterfall of ends, I think next time I’ll try an inside-out pile, lol! You realize that you’ve taken on the role of enabler here, Dayana. All of your beautiful projects are clearly implicated in my recent urges to cast on everything. (And I mean Everything.) I think I feel a bout of cast-on-itis coming on…. Two is really not enough! 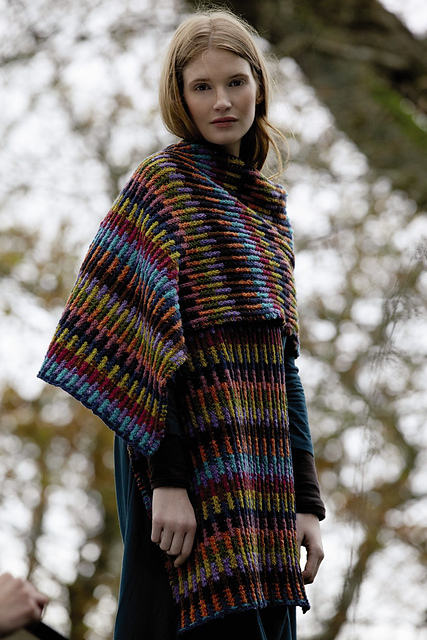 I dread to think how many I have on the go, but none so pretty or as complicated as yours, apart from my BMC by Kate Davies I am longing to wear it so am hoping it will give me the impetus to keep knitting. I have managed to almost finish (just need to get buttons and ribbons) projects today one I am happy with – one not so much. I love the turtle neck pattern – off to ravelry to see if I can find it! Sometimes I forget how many WIPs I actually have! You show admirable restraint! Like Dayana mentioned, I was also relieved to see a third WIP added to the pile! When your Soumak is finally finished you will wonder what made you procrastinate! It’s one of my favorite FO’s. The Exeter is going to be gorgeous!